Providing a forum for communication and enhanced understanding between the partners. The first workshop was held shortly after the consortium was formed in response to the announcement of the project by the NOC. Subsequent workshops expanded the risk register and the action plans as new information was acquired. The workshops did not examine operational threats and opportunities in detail unless they were important for the tollgate process. Additional workshops were envisaged should the consortium decide to bid, and again if any bid were successful. The workshop process followed the steps in the international standard ISO 31000 Risk management – Principles and guidance. This was compatible with the risk management processes of the consortium partners. GTL processes convert natural gas into longer-chain hydrocarbons that are suitable for vehicle fuels such as gasoline and diesel. A common GTL process uses the Fischer-Tropsch catalytic reaction to convert carbon monoxide and hydrogen to liquid hydrocarbons. The process is summarised in Figure 1. Natural gas is pre-treated to produce methane (CH4). As well as methane, other outputs from the pre-treatment include liquid hydrocarbons (condensates), sulphur and water. Air is separated cryogenically to produce oxygen (O2). The methane and oxygen are combined to form synthetic gas (‘syngas’), a mixture of carbon monoxide and hydrogen. Heat is recovered from the reaction. The syngas is catalysed in the Fischer-Tropsch unit to form long-chain hydrocarbons. The long-chain hydrocarbons are cracked (reduced in length) to form products for the market, including naphtha, gasoline, diesel and other fuel and lubricating oils. An important characteristic of hydrocarbons derived from this process is their very low sulphur content. The context stage of the risk assessment was completed prior to the first workshop and summarised in a briefing note for participants. The proposed work was an integrated project, in that it included upstream field development as well as downstream GTL processing. This was reflected in the set of key elements that provided the basic structure for identifying threats and opportunities in the workshops (Table 1). The elements were intended as a guide for brainstorming only, not a formal classification of project issues. An initial threat and opportunity register was created prior to the first workshop. It was based on risk registers for related projects in the country and risks generated from desktop research on the GTL process. However, the items in the register were not all documented clearly, and many were distinctly operational in focus and hence largely irrelevant to the project at this early stage of its development (although of direct relevance should the consortium submit a successful bid). The initial register grouped threats and opportunities into the key element structure in Table 1. This consolidated register was used as the starting point for risk identification in the first workshop. In the second pass, the participants reviewed and confirmed the risk rating for each threat and opportunity, and allocated a risk owner for each one. In the workshops, the participants chose a description that provided the best fit to the most likely consequence, using scales related to the criteria above. Where there was more than one relevant consequence criterion, they chose the highest level and the corresponding scale rating. The shareholder value and NPV criteria were rated in terms of the aggregate impact on the consortium. Likelihoods were analysed using an agreed scale, and consequences and likelihoods were combined using an agreed process. Limited time and lack of an approved economic model (in the absence of a contract structure for the project) precluded the detailed estimation of potential exposures at this stage. Potential exposures were to be estimated when the project economics had been established more precisely. The primary outcomes from the workshops were progressively updated risk registers for the project, with agreed priorities and assigned responsibilities. There were 21 high-priority threats and three high-priority opportunities after the first iterations of risk assessment. The most important uncertainty was associated with the energy price environment and potential rises or falls relative to the assumptions used in the economic base case. Other high-priority risks were concerned with in-country relationships, commercial matters, gas field development, project execution (particularly the effects of delay), and technical matters associated with the GTL process and technology. Risk coordinators were nominated in each consortium company, with responsibility for reviewing and maintaining the risk register, coordinating changes to the register across the companies, and ensuring each company was working from the same register. A list of ‘fatal flaws’ or ‘show-stoppers’ was prepared. This list contained the risks that had to be addressed successfully for the project to be taken forward for approval. It covered the fatal flaws from the perspective of each of the consortium partners, as failure by one would be a failure for all. While everyone was aware of the fatal flaws in broad terms, fleshing them out in more detail was very useful; by specifying explicit targets and hurdles, project activities could be focussed on what was absolutely critical for moving through the next approval gates. Risk owners were tasked to develop treatment plans for the high-priority threats and opportunities, and their effects were incorporated in the risk register. 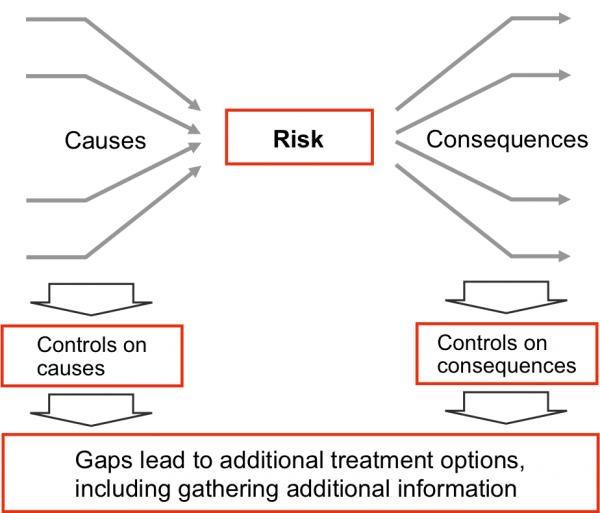 In particular, detailed bow tie analyses were conducted to identify and evaluate treatment options for the major risks (Figure 2). Many of the action plans related to due diligence activities and acquiring additional information to reduce uncertainty. The agenda for weekly meetings was adjusted to include a review of the risk register and the status of treatment plans. The company risk coordinators provided the support for this. An important lesson from this case study is that project plans do not need to have been developed in great detail for risk assessment to be valuable. The iterative assessment process used here demonstrated this. Each risk assessment provided a summary of the main current uncertainties, and these guided the team’s project development and their information gathering activities. In a project like this, where decisions had to be made under time constraints, it was beneficial to be able to defer detailed examination of areas of the project where there was little uncertainty until additional resources were available. The focus on opportunities as well as threats allowed additional benefits from the project to be recognised and captured more readily. The risk register had a high level of detail, within the constraints of limited information. This was a deliberate choice, to facilitate detailed management of specific risks in the development of the proposal. However, further analysis and consolidation of the risk register was necessary before final documents were prepared for project tollgate approval. Confidence amongst the senior management team that the detail existed and had been addressed within the project team.